About two weekends ago, I spent a considerable amount of time in the yard. My mom and grandma have extensive flower beds and vegetable gardens. I’m not sure I’ll ever achieve what either of them has for a vegetable garden, but I’m in the early stages of expanding our flower beds. The more flowers, the less we have to mow….right? 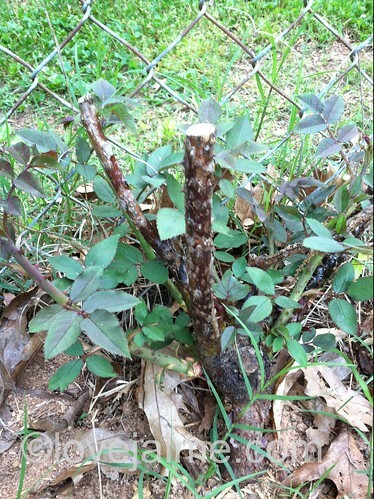 Last year, I bought a clematis from Lowes on clearance. 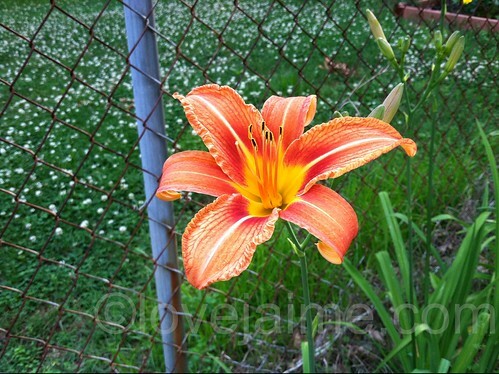 It returned this year and is winding its way through the fence. This year, I bought a climbing rose plant from Lowes. Also on clearance, I believe it was $5. My mom doubted my green thumb and kept lecturing me on watering it enough. I think I finally listened to her enough because the plant has new growth! A few weeks ago, I was at Target (no surprise there) and found some calla lily bulbs that were on clearance. We were right at the end of the planting season for those bulbs, so I bought them and planted the bulbs that night. I’m hoping for flowers by the end of the summer. 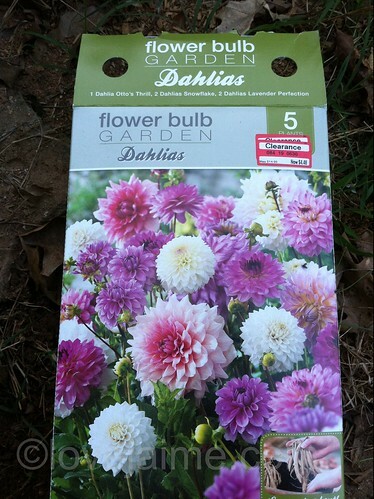 Two weeks ago, I came across a pack of dahlia bulbs at Target (again, on clearance for $4.48.) I decided to give them a try. I planted them on Sunday along a rock wall we have – I like to play with this wall every summer, but I planted these near the very end where nothing else has been planted. Two of the bulbs looked pretty dried out, so I may not get lucky with these. 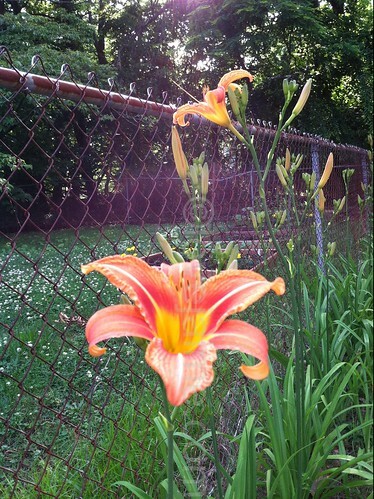 Last year, my mom planted day lilies along the outside of our fence. I added to the lilies with even more lilies (all from my mom’s yard.) I had a few plants left over, so I’ve placed them in spots around my yard. We’ll see if they take. I don’t know if I really planted them deep enough. I’m happy to report that the lilies decided to bloom this weekend! Two opened up on Saturday and we had eight on Sunday! A lot of the plants in my yard have been given to us by my mom and other neighbors who are overrun with plants. If I ever have plants that we no longer want, I’ll definitely return the favor and gift them to people. Do you have a green thumb? A favorite flower/plant for your yard? I’m a huge fan of hydrangeas. I have one that my family received after my grandpa passed two years ago. It was gorgeous the first year, didn’t bloom much last year, but it’s definitely getting bigger and I have flowers forming this year! If we ever move, I hope I can take a clipping or something to plant at another house.